A few weeks ago, a friend shared a batch of Mrs Beasley’s Chocolate Truffle Cookies with me, saying that they were some of the best chocolate cookies she’d tasted in a long time. The cookies were excellent, although a bit messy to eat because of their heavy powdered sugar coating. They were very moist and almost melted in your mouth, and hand an intensely chocolate – but still sweet – taste. It was like eating a cross between fudge and cookie dough: rich, chocolaty and delicious. Of course, I had to try to make homemade version of these cookies. I knew that I was looking for a rich cookie that was made with cocoa powder, because of the intense flavor and the lightness of the truffles. Melted chocolate can often make cookies a bit heavier and doesn’t necessarily give the intense flavor of cocoa powder. I started out with a recipe that sounded similar, but after making a test batch and discovering that they spread out more than the Mrs Beasleys cookies I was trying to replicate, I made a couple of changes to the way they were baked until I came pretty close. My cookies still weren’t as huge as the Mrs Beasley’s cookies (although they were certainly a lot less expensive! ), but they had a melt-in-your-mouth moistness and a very rich chocolate flavor to them. And, they were a little messy to make and eat thanks to the powdered sugar coating. They have a surprising amount of flour in the recipe for a cookie that tastes very similar to an actual chocolate truffle, but the flour is what helps the cookies keep their shape, along with the coating of cocoa powder that is added just before the cookies go into the oven. I’m biased, of course, but I think that these were better and fresher than Mrs Beasley’s. And, unlike the purchased cookies, you can eat these while they’re warm and melty from the oven (pre powdered sugar) and that amazing experience is well worth the effort of baking them yourself. In a large bowl, cream together butter and sugar, adding sugar in slowly so that it doesn’t turn the kitchen white. Sift in cocoa powder and salt, and mix until well integrated. Beat in sour cream and vanilla extract. With the mixer on low, blend in flour until no streaks of flour remain. Stir in chocolate chips. Shape the dough into 1-inch balls and roll in the cocoa powder and place on baking sheet. Do not flatten cookies. Cookies will not spread too much, so they can be placed fairly close together. If your kitchen is very warm and the dough is hard to handle (i.e. if you’re making these during the summer, you might want to refrigerate the dough for 30-60 minutes before shaping the cookies). Bake for 10 minutes. Cookies will just barely be set. Let cool on baking sheet for 3-5 minutes, then transfer to a wire rack to cool completely. 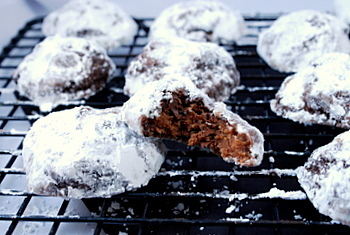 When cookies have reached room temperature, after about 30-45 minutes, roll in powdered sugar until completely coated. Thank you! They just looked so good that I wanted to try them right away . . . Warm and melty from the oven always always always beats purchased cookies. These look dreamy! Nicole, did you use natural cocoa, or Dutch processed? Heidi – I have used both natural and dutch processed in this recipe. The cookies in the photo are actually made with a combination of the two types of cocoa powder. I couldn’t wait to make the cookies this morning! They are amazing! I used Hershey’s cocoa and semi sweet chocolate chips. My husband can’t get enough of them. I made these cookies and everyone at work LOVES them! However, mine spread a little more than yours in the photo. I chilled the dough and used a Silpat. Any thoughts on how to slow the spread? Great Blog with beautifull photos ! 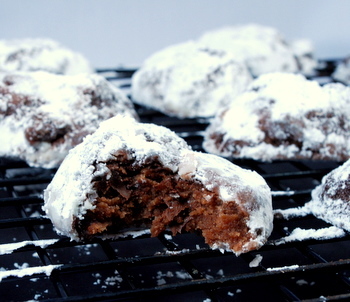 I am looking for a chocolate cookie that is baked rolled in powdered sugar and kept in the freezer and does not turn hard. These cookies are wonderful. I can not get the person who makes them to share the recipe. I know it has to be out there somewhere. I baked these and they’re wonderful, but they spread quite a bit — any suggestions? My new favorite cookie!! I used an extra cup of Guittard chips and refrigerated the dough for an hour before rolling and baking. I’ll be making a double batch for a trip next weekend – thanks so much Nicole! These were amazing! I was afraid mine would spread as the dough was quite soft and I didn’t have time to chill it, but they didn’t spread much at all. I will be making these again… and again… and again! These cookies are amazing. I made them for my boyfriend’s family at thanksgiving, and they have demanded them at every holiday ever since. I even sent them home for my dad’s birthday ON thanksgiving, and the rest of the family stole them. I have tried to make these twice and both times they flatten out and are paper thin. Any suggestions? Lena, don’t butter or put oil on the pan. If you use wax paper, they don’t spread as much. The oil makes them spread out. Hi Nicole, beautiful blog and nice photos! I’d like to make this, but first, may I know from your experiments, which chocolate is the best for this kind of cookie, is it bittersweet, semisweet or milk chocolate if we can call it chocolate? Thanks! Ram – I used regular semisweet chocolate for these cookies and that is what I tended to get the best results with. Dark or bittersweet chocolate would be fine. Would these cookies still be good within 5 days after baking it? I’m planning to send this out of State and I’m just wondering wether it will get there still good and yummy. One more thing, is it possible to double this recipe? Thanks a lot. Ram – Yes and yes. Just be sure to pack them in an airtight container and use express or priority shipping to make sure they’re as fresh as possible! I just made these and they are great. I rolled they, by mistake, in a mixture of the powdered sugar (for rolling) and the cocoa powder. I didn’t read the recipe through, and I though that I was to mix the two and then roll before putting them in the oven. Still good!! What if i dont have the chips….?. Would the texture still b the same ? Sara – They will keep for a week or so in an airtight container. Mariam – The texture of the cookies will be the same, but you won’t get that extra burst of chocolate and you will probably get slightly fewer cookies overall. You can also chop up a chocolate bar to make your own “chips” for these cookies if you have some on hand. I made these 2 years ago but I lost the recipe and couldn’t remember where I found it. Thank goodness I found your page again because this stuff is like drugs @_@ It’s sooooo good. I definitely need to make them again!! When I last made them, I was baking for friends but ended up stealing the container with them and eating most by myself because it’s so addictive. These things started war among my friends and I because we all wanted for ourselves xD Absolutely fantastic!